Listening for God While Listening to Others"
The NOMINATING COMMITTEE for the 2019 Pacifica Synod Assembly needs your help in surfacing names of persons able to serve our synod in an elected capacity. Please provide the information requested on this nomination form to Nomination Chair, Pastor Karen Marohn by email at pastor@stpetersbythesea.org no later than February 27, 2019. The committee will make contact with the nominee to determine a willingness to serve. To meet the inclusivity requirement of our Synod Constitution (S6.04) we will accept nominees to fill the following positions as shown below. Designations male/female are made in an effort to provide 50/50 balance. We are seeking two nominees for each position. The congregational registration fees for this year's assembly have been reduced by $50. An invoice was mailed on January 22 to each congregation, detailing voting member assignments for your congregation and allowing congregations to take advantage of an Early Bird Discounted Congregational Registration Fee ($495 for 3 voting members) if paid by February 28, 2019. Please note that the discount only applies to the congregational registration fee. After February 28, the congregational fee increases to $550. The cost for any additional voting members is $100. Fee reductions for smaller congregations may be requested. To do so, please contact Rachel Line at rachelline@pacificasynod.org by February 28, 2019. Please note that fee reductions are based on financial data reported with your 2017 Congregational Report. Just a reminder - payment of this invoice does not register any individuals from your congregation! You will have the opportunity to register your voting members and visitors through the online registration registration process beginning on March 1, 2019. Watch for the link to register on our website and in our e-newsletters. The deadline for submitting resolutions for the 2019 Pacifica Synod Assembly is FEBRUARY 11, 2019. If a resolution comes in after this deadline, it will be submitted to the Pacifica Synod Council Secretary and will be brought to the floor of the assembly and will require a two-thirds vote by the assembly to be considered. For detailed information on resolutions, please see this document. Please submit all resolutions to the Pacifica Synod office by mail (1801 Park Court Place, Bldg C, Santa Ana, CA 92701) or by email ( RachelLine@PacificaSynod.org). For questions about resolutions, please contact the Rev. Laura Ziehl at 760.814.5141. For more information about the 2019 Pacifica Synod Assembly as it becomes available, please visit the Assembly Page on our synod website. Members of the Pacifica Synod AMMPARO network, have visited the shelters for migrants in Tijuana and strive to have an on-going, supportive relationship with these organizations. In September 2018, Pastor Nate Allen from Clairemont Lutheran Church, led a group from Pacifica Synod and the ELCA AMMPARO network to Instituto Madre Asunta, a shelter for women and children in Tijuana. This shelter is associated with Casa de Migrantes, a ministry of the Scalibrini Order of the Catholic Church. We met with the Mother Superior and social worker and learned about a specific need for a teacher for the children in the shelter. We were informed that the salary for a teacher in Mexico is about $400 per month (about $4,800 per year). We hope to raise at least one year's salary by asking each interested congregation to raise between $400 and $800. The first installment will be sent in early 2019. AMMPARO page on the Pacifica Synod website. Congratulations to the Rev. Canon Susan Brown Snook! On February 2, 2019, the Episcopal Diocese of San Diego elected the Rev. Canon Susan Brown Snook, 57, as their fifth diocesan bishop. She was elected on the first ballot with 45 clergy votes and 71 lay votes. Brown Snook, who is currently the canon for church growth and development in the Diocese of Oklahoma, previously served as a church planter in Scottsdale, Arizona. In a previous career, she was a certified public accountant. She has been married to Mr. Tom Snook for over 30 years. They have two adult daughters, Sarah and Julia. All rostered ministers in the ELCA are required to complete an annual report to the bishop. Follow this link to select the applicable report from the ELCA website page. This report is a fillable PDF. To ensure that your report is saved properly before sending or printing it, please follow the instructions below. Once completed, please return this form to the synod office by email (see below), fax (714.692.9317), or by mail to the Pacifica Synod office at 1801C Parkcourt Place, Santa Ana, CA, 92701. Right-click or control-click (on a Mac) on the file you want to use and select "save file" so it gets saved on your computer in a place you can find. Close the webpage! Don't type your answers in the webpage version! Find the file on your computer, and open it in Acrobat or Preview or another .pdf reader. Fill out a couple lines of the form. Save it. Close the file. Reopen it to see that the data is being saved correctly. Finish completing the file and save it. In December, the ELCA mailed the 2018 Congregational Report forms to all congregations.The mailing included Form A, Form C, the instructions, and the financial worksheet. In addition, the Congregational ID number and password for online reporting were included in the mailing. You will need these items to login and file your report online. To do so, follow this link. The information included in these reports is vital to the ELCA's commitment to improving its efforts to spread the good news and are used in allocating the ELCA's resources to synods and congregations. Did you know that the information you submit (or do not submit) in your parochial report goes into your congregation's trend report, which is publicly available online? Seekers looking for your congregation can see not only the information you submit but also whether the congregation hasn't submitted parochial reports. The due date for these forms is February 15, 2019. If you can't find your login information, please contact Carol Youngman at 714.692.2791 or by email at carolyoungman@pacificasynod.org. Congregations are asked to submit their 2019 Statement of Intent as soon as your 2019 budget is approved. You may find a copy of the fillable 2019 Statement of Intent here for you to complete and return to the Pacifica Synod office as soon as you are able, if you haven't done so already. You can mail them to the synod office or email them to terrirobertson@pacificasynod.org. Amid all the talk of the church in decline, Presiding Bishop Elizabeth Eaton, in her February column for Living Lutheran, wants us to ask a new question. Instead of "What can we do?" we should ask, "What is God up to?" so we can open ourselves up to the life-giving promise of God's future. Read her column in English at https://bit.ly/2GgCbkg and in Spanish at https://bit.ly/2BnwTjy. The ELCA Office of the Secretary will be offering a free webinar for congregations titled, "Legal Checklist for Congregations" hosted by its general counsel, Thomas Cunniff and associate general counsel, Aja Favors, on February 21 at 12:00 noon, Central Standard Time. To register for this free webinar and receive a link and password, go to https://elca.org/legalwebinar by February 15, 2019. This Lent, we invite you to focus your congregation's Lenten activities by joining us during ELCA World Hunger's 40 Days of Giving . Together, we'll experience how the grace of Christ moves us to engage in transformative works of love around the world through ELCA World Hunger as God calls us into the ministry of hope, liberation and restoration. Congregations were sent a packet of resources for engaging in the practices of Lent in the mail in January. Visit www.elca.org/40Days to download or order these resources and get started today. 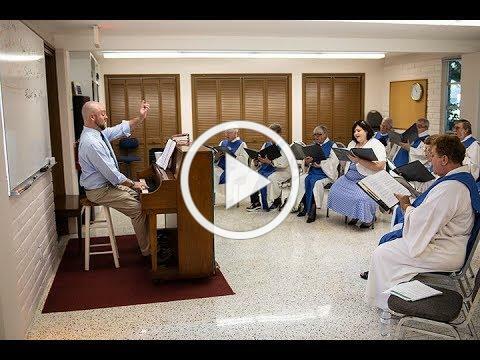 Every Sunday, Lutherans across the country gather to hear God's word and worship God through song. No matter where we're from, our faith binds us together. Similarly, ELCA members are connected through Mission Support. When we share Mission Support offerings with the wider church, we make ministry possible across the country and around the world. Mission Support is paramount in our efforts to raise up new leaders in the ELCA. In this new video , Deacon Ryan Hostler talks about his seminary training, which was funded in part by Mission Support. Such training prepared him for a career "nurturing the song of the church." Find a corresponding story about Ryan in the current issue of Stories of Faith in Action. For a PDF version of this Mission Support Memo to share with your congregation, click here. Participation in this event requires no registration. On the morning of March 9, simply go to https:www.elca.org/stewardship and click on the widget titled stewardCast2019. You will be connected immediately. Each participant will be given an opportunity to submit questions through the chat feature and to receive resources after the event. You are cordially invited to the installation of the Rev. David Hendrickson to the ministry of Word and Sacrament as a Pacific Health Ministry Chaplain serving Pohai Nani of the Evangelical Lutheran Good Samaritan Society. The installation will be at Pohai Nani on Sunday, February 17th, 2019 at 4:00 p.m. Visitor parking is located below the Port Cochere on the circle drive. Parking is limited, there will be a greeter directing visitors where to find additional overflow parking if needed. Clergy are invited to wear a clergy shirt and/or a white stole. There will be a time for fellowship following the installation service. Refreshments will be served. On Saturday, February 2, we celebrated this evening with Pastor Moses Barrios as he was ordained as a Minister of Word and Sacrament in the ELCA and installed as pastor serving Crave Life and Shepherd of the Hills in Whittier. Congratulations and blessings on your ministry together! You are invited to CLUE's 4th Annual Architects of Justice Gala and Celebration , to be held on February 28, 2019, at Temple Beth Sholom ( 2625 N. Tustin Ave, Santa Ana, CA 92705 ), at 6:00 p.m. This year's honorees are: UNITEHERE! Local 11 member-leader Glynndana Shevlin and the Disney Workers, who won a living wage in Anaheim this year through tireless effort and struggle, and Farrah Khan, Irvine City Councilmember and Executive Director of the Newport Mesa Irvine Interfaith Council, whose commitment to justice and fair treatment for all is evident in everything she does. We will also welcome special guests Deacon Roberta Wall of Our Savior's Lutheran Church in San Clemente and a recent asylum-seeker whose powerful story of transformation in immigration justice calls us to action -- and a renewal of our shared commitment to building a just and sacred Orange County. It will be a memorable and enjoyable evening. To buy a table, CLICK HERE . To buy individual tickets or ads for the tribute book, CLICK HERE . We look forward to seeing you! For a printable event flyer, click here. Come to El Camino Pines & Luther Glen where we will be given a deeper understanding of the God that has already named and claimed each one of us, with a love too abundant to comprehend. Our Winter Retreats at both sites feature special programming designed by our year-round staff. Friday to Sunday retreats run from 7 p.m. on Friday evening through lunch on Sunday. Saturday to Monday retreats run from 4 p.m. on Saturday through brunch on Monday. Deciding whether seminary education is right for you? Join others for Signs Along the Way, a weekend visit and discernment retreat at Pacific Lutheran Theological Seminary in Berkeley on March 8-11, 2019. Explore your sense of call to ministry, experience the Bay Area and interact with the PLTS community. Lodging and meals provided. Travel scholarships are available! Register now at PLTS.edu/signs or by calling 510.599.2730. In our synod e-newsletter, prayer requests may be shared for our synod's rostered ministers, spouses, key lay leaders and congregations. Survivors of Torture, International, located in San Diego, presently has a full-time position available for a Children & Family Therapist. Click here for the job posting and additional information. This is a part-time position as Director of Youth Ministries for both Lutheran Church of Our Savior and Spirit of Hope Lutheran Church, San Bernardino. For a complete job description, click here. Applicants are asked to send a resume and three (3) references to one of the email addresses below. Upon offer of employment, applicant will be subject to a criminal background check and a thorough check of all references. Interested parties may send their applications to the church offices of either church at office@lcosavior.org or office@spiritofhopechurch.org. Questions about the position may be director to Pastor Scottie Lloyd at 909.882.5013 or 909.553.5196.